DSM V2 is one of those quasi-magical plugins, destined to become a studio classic. Flexible, powerful and effective. Excels at many applications. Truly unique approach. Highly flexible. Capable of natural-sounding results. Quick and easy to learn and use! Parallel processing rocks. Paul Frindle and Paul Ryder launched Pro Audio DSP in 2008, having worked together as key members of the Sony Oxford team. Their debut - and thus far only - product was the highly impressive Dynamic Spectrum Mapper, described by the developers as a "prismatic compressor". 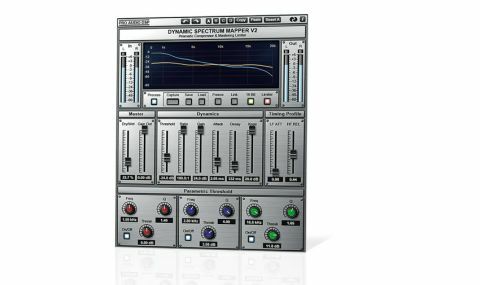 Dynamic Spectrum Mapper V2 sees the addition of 64-bit compatibility, AAX format support (on top of the existing VST/AU/ RTAS), a Dry/Wet fader for parallel processing and an attenuation fader on the output. "DSM is something like a multiband compressor: it splits the incoming signal into frequency bands and uses compression and limiting to sculpt the sound"
For the uninitiated, DSM is something like a multiband compressor: it splits the incoming signal into frequency bands and uses compression and limiting to sculpt the sound. However, DSM differs from your average multiband compressor in two key ways. For starters, it uses many more bands, resulting in far greater detail in the midrange and top end. Most unusually, before you start processing with DSM, you need to first analyse a 'source' signal, which the software will then use as a virtual 'reference', pushing the processed signal closer towards its dynamic and tonal qualities. Since DSM works with dynamic as well as spectral information, there's plenty of scope for its application. The basic workflow involves capturing the profile of a desirable signal, then applying that profile to your target audio. Often, this will be a case of capturing the best- sounding part of the signal in a section of a track and using it to reshape the rest of the same track. For example, an over-sibilant vocal can easily be treated by holding down the Capture button during a passage where no sibilance occurs, then when the vocal track is processed by DSM, the sibilance is suppressed throughout the entire performance. In another example, you could capture one of the the bright, loud transients from a drum buss and use it to increase the overall level and brightness of the whole drum mix. Or perhaps you'd like to apply the sound of one instrument or even an entire mix to another - DSM's got you covered. "It's a forward-thinking processor that produces amazing results, often replacing whole chains of effects"
Even at extreme settings, DSM doesn't suffer from the typical distortion or choking artefacts of compression (although with careful settings, you can make it produce creative pumping effects). Nor does it suffer from the typical crossover frequency problems associated with multiband compression. Rather, it generates its own particular artefacts if abused, resulting in a grainy, distorted sound or just an unusual frequency curve when the captured profile is inappropriate for the destination track. However, it's difficult to make it sound bad under normal operation, and fixing poor sounds is made easy by the low- and high-frequency Timing Profile faders and the Parametric Threshold controls (like an EQ applied to the capture). In conclusion, Dynamic Spectrum Mapper is genuinely capable of dramatically improving almost any audio material, usually within a few minutes at most. It works in sympathy with the original signal to prevent unusual artefacts and sounds good enough to be used for both mixing and mastering. It's a forward-thinking processor that produces amazing results, often replacing whole chains of effects and saving hours of tweaking.